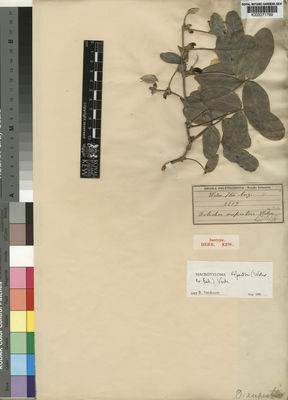 Macrotyloma rupestre (Welw. ex Baker) Verdc. This species is accepted, and its native range is Congo, DR Congo to S. Tropical Afrixa and Namibia. Prostrate herb up to 1 m long, from a perennial woody rootstock; juvenile stems sometimes flowering before leaves appear. Stems annual, slender, densely appressed to sparsely spreading silvery pilose. Leaves pinnately 3-foliolate; leaflets 28–70 × 12–30 mm, oblong to oblong-elliptic or obovate, rounded at the apex, apiculate, rounded to slightly cordate at the base, densely appressed silvery sericeous to appressed pilose on both surfaces; petiole 2–10.5 cm long; rhachis 2–16 mm long; petiolules 1–2 mm long; stipules 5–10 × 2.5–4 mm long, narrowly ovate, striate; stipels 5–8 mm long, linear-lanceolate or filiform. Flowers axillary, solitary, in pairs or in 3-flowered fascicles; peduncles and pedicels 2–5 mm long; bracts and bracteoles 4–5 mm long, lanceolate, silvery sericeous. Calyx densely appressed silvery sericeous; tube 2–4 mm long; lobes 3–6 mm long, triangular, acuminate, the upper pair fused along almost all of their length. Standard yellow tinged pink, greenish-cream or pink, 1.2–2 × 1–1.5 cm, broadly elliptic, emarginate or not at the apex, yellow, with awl-shaped appendages 4–6 mm long; wings and keel 10–13 × c. 3 mm. Ovary 6–7 mm long, appressed sericeous. Pod 5–7 cm × 6–7 mm, linear-oblong, compressed, pubescent, glabrescent, 4–6-seeded.